The Targus Laser Presentation Remote features a simplistic button layout, making it easy to give presentations. 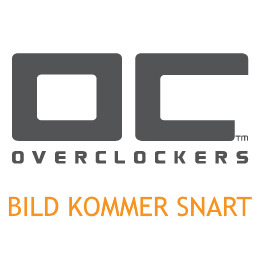 The patent-pending KeyLock™ Technology locks non-essential buttons when not needed to help eliminate accidental button presses. The integrated laser pointer allows the presenter to highlight important content while the backlit buttons provide visibility in environments with low lighting. The latest RF 2.4GHz cordless technology works from up to 50ft away, providing flexibility while presenting in large conference rooms or classrooms. 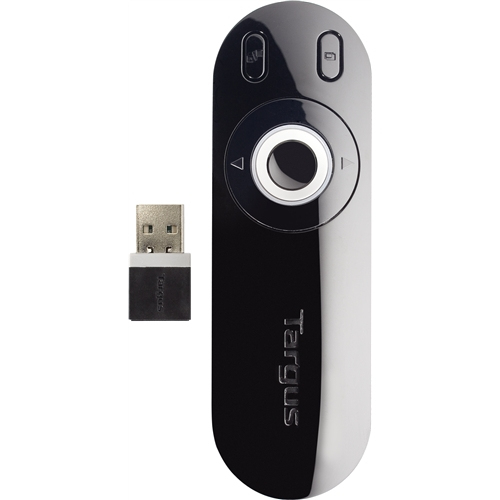 The mini USB receiver stores inside of the presenter so it's always ready to use, while the back-up battery compartment stores an emergency battery so users are always equipped to present. 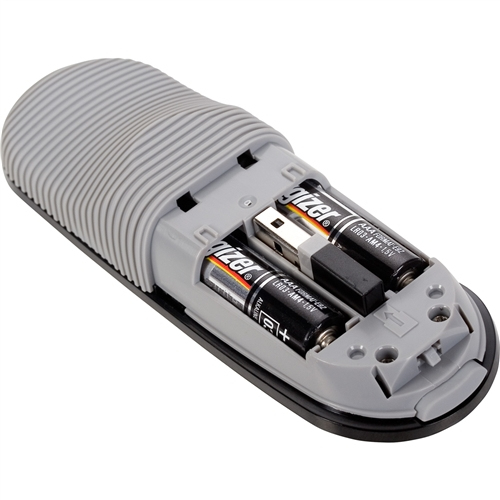 The device is immediately ready to use and comes stocked with high-quality AAA Energizer® MAX® batteries. 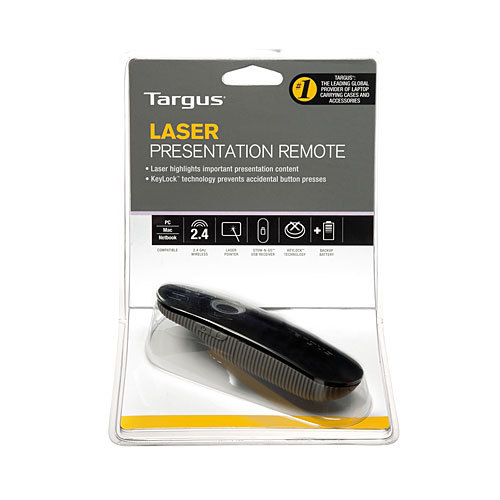 Both stylish and functional, the Targus Presentation Remote is easy to operate for seamless presentations at work or school. -Functionality – Simplistic layout enables users to open and operate a presentation with ease. Laser pointer makes it easy to highlight presentation content while the back-lit buttons make it easy to present in rooms with low-lighting. -KeyLock™ Technology – Patent pending technology locks non-essential buttons to eliminate accidental button presses. -Ergonomic – Ergonomic design feels comfortable in your hand while presenting. -Wireless – Wireless technology operates up to 50ft. away for added flexibility; USB receiver stores in presenter. 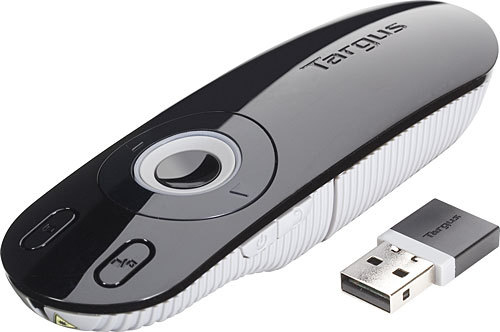 -Compatibility – USB port required; True plug-and-play device, no drivers required; PC/Mac and netbook compatible. 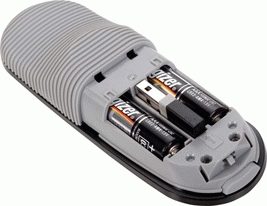 -Back-Up Battery Compartment – Stores an emergency battery.